Adhesive sticks better than ‘super glue,’ but can production be scaled up? 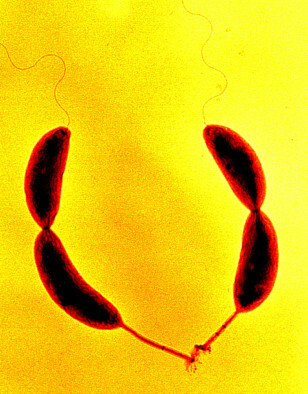 The bacterium known as Caulobacter crescentus affixes itself to solid objects with its stalk and holdfast. Here, two "stalk" cells, at the bottom, spawn two mobile "swarmer" clones of themselves, at top.